Blue Velvet is 50% indica/50% sativa although the indica genetics are the dominant ones which tend to be expressed more clearly. The parent genetics come from Purple Thai (a cross of Oaxaca Gold and a special Chocolate Thai) and a powerful Afghani Indica. In the 1990?s Dutch Passion worked together with the original Blueberry breeder, this was the time when Dutch Passion first introduced the Blueberry family into Europe. Blue Velvet has been bred using original seed-stock from that 1990?s breeding project. She produces a fast-hitting and velvety smooth high. Indoors Blue Velvet will give good yields, though she will often remain short at around 50-60cm, therefore she is good in SOG (sea-of-green) grows. Blue Velvet forms a sturdy main bloom frosted with lots of resin, indoors she requires 8 weeks to flower. Outdoors she is ready by the end of September/early October. She may show blue colourations especially when exposed to cooler indoor growing conditions or when grown outdoors. When grown outdoors in a good climate Blue Velvet can reach 2-3m tall. Blue Velvet is easy to take cuttings from and able to take reasonably high nutrient levels. She is celebrated for an uplifting and euphoric high with a fruity floral taste. 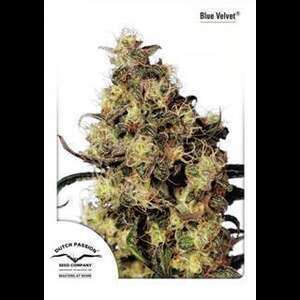 Blue Velvet is an old classic and connoisseur favourite, very potent and highly recommended.